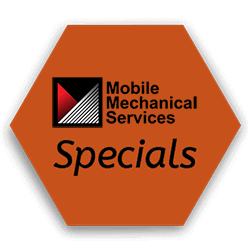 Mobile Mechanical Services - Special Deals. Get on our list! We are excited about our specials service. All you have to do is take a few minutes to fill out our form below. Once you are done, you will get a confirming email saying we received your submission. Then when we have specials come up, you will get an immediate notification in your email box. All of our customers are special and we want to help you save money, so when we save money from a deal we received from the manufacturer or if we have a product that has been discounted, then we want to pass that savings along to you. Take a moment and get on our list. We promise to respect your privacy and only use this list to send you information about our specials. Please Contact Us if you have any questions.